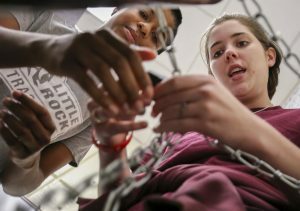 A group of chemistry students at the University of Arkansas at Little Rock found out that book smarts alone were not enough to overcome an escape room final project. Inspired to build teamwork amongst his students and to make class more exciting, Dr. Anindya Ghosh devised a unique escape room group project to challenge the students in his Intro to Inorganic Chemistry class. 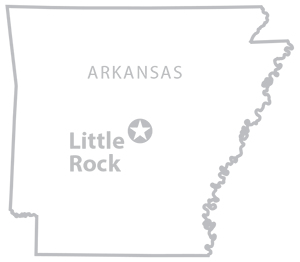 Students in the class include Cecilia Cayll, Samantha Crosby, Robert Hill, Akeia Joyner, Arsalan Karimi, Caroline Kornelsen, Thuy Le, Tyler Maxwell, Victoria Mchargue, November Palmer, David Standridge, and Caleb Stein. The class divided into groups of four, and each group was responsible for creating puzzles involving chemistry lessons from class. The groups also had to use images from popular culture to give the teams additional clues. One group determined their number was eight after noticing that their clues contained a picture of a brown recluse spider with eight legs and a picture of a piano player whose hand spanned eight keys. “You would have to be a musician to figure it out, and I’m glad I am,” said Akeia Joyner, a senior chemistry major. A second group figured out their number was five after having an image from the movie “The Fifth Element,” an image from a Cinco de Mayo celebration. Additionally, one of the answers to their chemistry problems was Boron, which has an Atomic Number of five on the periodic table. Chemistry students Akeia Joyner and Victoria Mchargue had to solve a series of science problems to get clues to unlock their classroom door during an escape room challenge. Photo by Benjamin Krain. Each group needed to come up with one number as their answer. The combination of the numbers from all four groups would provide the answer to escaping the room. Even after all four groups worked together to escape the room, Ghosh put one more roadblock in the road to victory. The combination needed to open the chain that locked the classroom door only used three numbers, so students were also tasked with figuring out which number was left out and what order to put the remaining three numbers. It turns out that the most difficult part of the escape room challenge was putting the correct combination into the lock. Fellow classmates commented that it was “hilarious” to watch their classmates unsuccessfully try to figure out the combination. “We’re book smart, not street smart,” Cayll said. Students finally reached the correct combination, before the end of the class period, after they realized the lock was backward, and they had been inputting the combinations the wrong way. 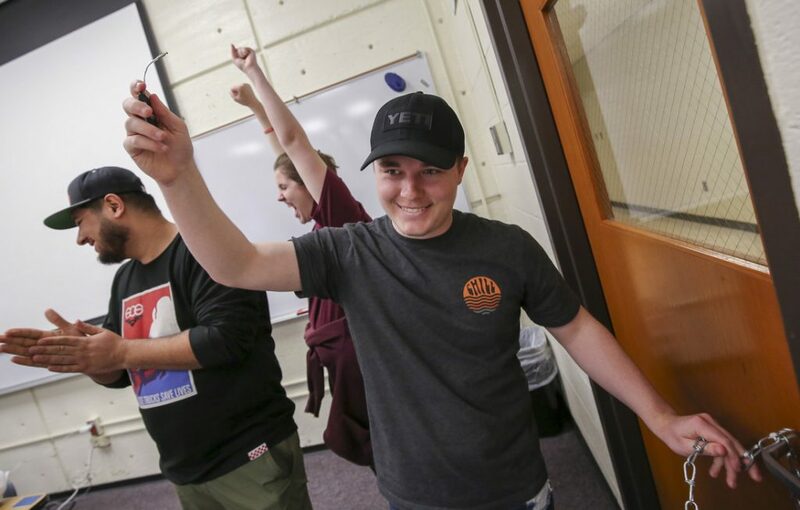 In the upper right photo, chemistry students (L to R) Arsalan Karimi, Victoria Mchargue, and Caleb Stein celebrate their victory in escaping from their chemistry classroom after solving a series of puzzles. Photo by Benjamin Krain.